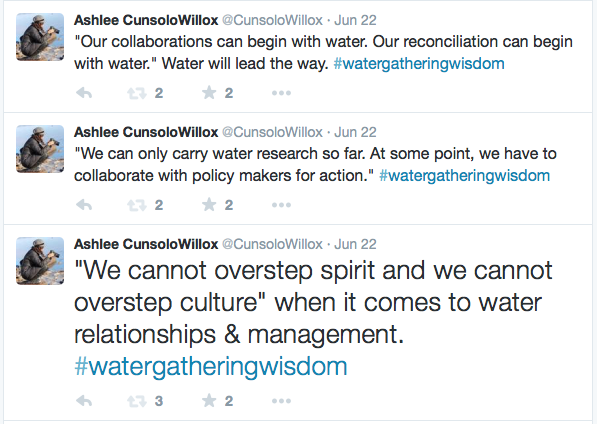 For the past year, I have had the pleasure and privilege of being part of an amazing team working on a cross-Canada project to discover strategies for integrating and incorporating Indigenous and Western Knowledge for better water management and policy in Canada. Led by Dr. Heather Castleden at Queen’s University, our Core Team of myself, Dr. Sherilee Harper, and Dr. Debbie Martin, have been so privileged to work with a National Advisory Team and over 40 stakeholders from across Canada on this work, as well as Catherine Hart, our amazing Project Manager, and Lindsay Day, Rob Stefanelli, and Kaitlin Lauridsen, our excellent research assistants. A key component of this work are annual Water Gatherings that bring together First Nations, Inuit, Metis and non-Indigenous peoples to discuss how we can better live with water, and how we can move forward, through Two-Eyed seeing and integrative knowledge approaches, to better preserve and protect water in Canada. I am always so humbled by the wisdom, passion, heart, and dedication shared at these gatherings, and by the teachings from the Elders, including Elder Albert Dumont, Elder Barbara Hill, Elder Maria Campbell, and Elder Albert Marshall. This research is funded by the Canadian Water Network, with further information about the project available here. Some of the best travelling companions one could hope for — the Unama’ki Delegation. Flying in style with Elder Albert Marshall. Getting set up and ready to go for the 2nd National Water Gathering, with Guy Freedman and Heather Castleden. The beautiful setting for the Water Gathering at the Wabano Centre in Ottawa. A dedication to the Wabano Centre.